A truck goes through a pothole that was cold patched on Garland and Forest. The rain and melting snow has washed out some of the patched potholes. Bangor’s roads are in a better condition than they were a week ago. 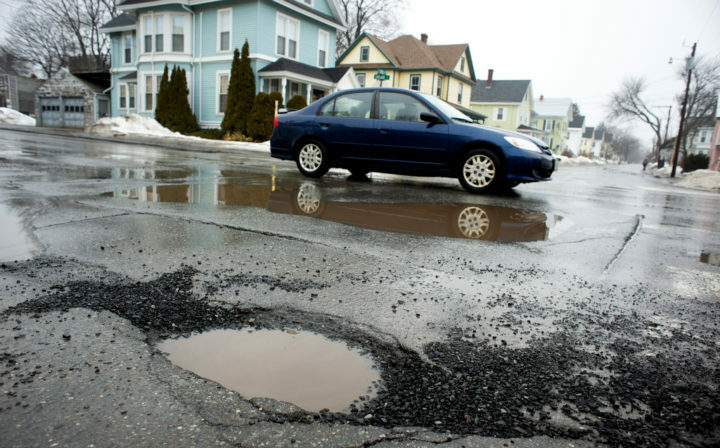 The Bangor Public Works Department last Friday shifted into high gear after the Bangor Daily News released a map marking the locations of nearly 200 potholes scattered across the city’s main arteries. The department sent out six crews to work over the weekend and patch up all of the potholes within 24 hours. Public works crews used the BDN’s pothole map as a guide. 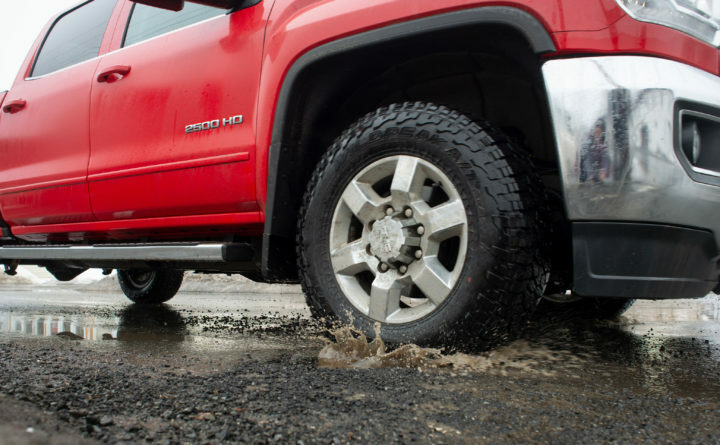 As a matter of practice, they patch potholes within 24 hours of receiving reports of them. After buying 33 tons of cold patch in bulk on a rainy Friday afternoon last week, crews got to work patching up the worst of the potholes on State Street and in surrounding areas. However, due to the wet, rainy conditions, most of the cold patch did not stay in place and six crews working overtime on Saturday had to redo most of the repair work they had done the day before. A pothole that was cold patched on Garland and Forest, as seen on March 15. The expected rain this weekend might mean that crews will have to fill in additional potholes they have repaired recently. Cold patching is a temporary fix, but it’s the only one available to public works crews until they can acquire asphalt from the pavement plants that open once the weather warms up around late April. Willett said the mass patching effort required 13 public works employees to work overtime on Saturday, starting at 6 a.m. Coupled with the bulk purchase of cold patch and the cost of fuel for their trucks, the costs to the city added up, Willett said, though he didn’t have a precise figure.